The Hamburg-based Carlsen Verlag is one of Germany’s largest publishers of books for children and young people. 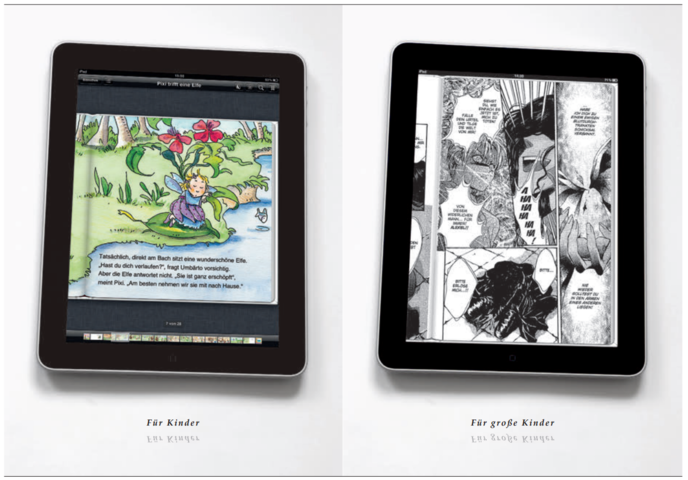 Having begun offering its successful Pixi book series in Apple’s App Store, Carlsen also wanted to make this series available in the iBooks Store as EPUB e-books. It also wanted to harness the potential of fixed layout and the audio-text synchronisation offered by iBooks. le-tex created the fixed layout versions of the Pixi books and synchronised the existing audio data with the text according to the EPUB3 standard. le-tex also prepared the data for Kindle Fire in KF8 format. For the manga books, the most important task was to prepare a large production volume promptly for the different reader systems. le-tex developed a workflow for this which processes PDFs of very different qualities reliably and effectively and converts them into fixed layout e-books. This needed to take into account certain anomalies such as the fact that manga is typically read from right to left.